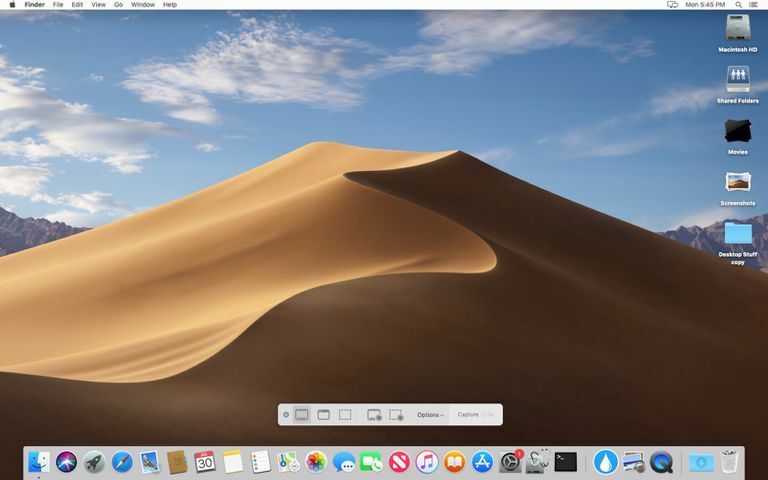 macOS Mojave introduced updates to the screenshot capabilities that have been part of the Mac's OS since its very introduction. Along with new screenshot features you can now use the same tools for recording your screen. Command + shift + 3 (The command key, shift key, and the number 3 key all pressed at the same time) to capture an image of your entire screen. command + shift + 4 to take a screenshot of a selected area of the screen. Command + shift + 5 opens the screenshot toolbar near the bottom of your Mac's desktop and provides easy access to a number of screenshot and screen recording options. Having all the screenshot related tasks in one toolbar is an improvement over the older method of using individual keyboard shortcuts to invoke screenshot options. While you can still use the older shortcuts, it is a lot easier to just remember a single keyboard shortcut of command + shift + 5. Arrange your Mac's desktop, windows or other screen elements as you would like them to appear, then open the screenshot toolbar by pressing command + shift + 5. The screenshot toolbar will appear centered near the bottom of your screen. Click or tap the first button at the far left of the screenshot toolbar. If you're not sure which button, let your cursor hover over a button for a description of the buttons function to be displayed. Once you press the Capture Entire Screen button, the cursor will change to display a small camera. Clicking the mouse or tapping the trackpad will take a screenshot of the entire screen. Capture Selected Window will allow you to capture any visible screen element, including the Dock, desktop, windows, menus. Click or tap on the Capture Selected Window button. The cursor changes to a camera and moving the camera into a screen element will highlight the item. Once you have the correct screen element highlighted, click the mouse or tap the trackpad. To capture a selected area of the screen click or tap the Capture Selected Portion button. A rectangular crop outline will be displayed. You can resize the crop marks by dragging from the side or corners. You can move the crop outline to highlight the area you want to capture by moving the cursor into the crop area; the cursor will change to a hand. You can now click or tap and drag the crop outline to where you need it to be. Once you have the crop sized and positioned correctly you can take the screenshot by clicking the Capture button in the screenshot toolbar. Save to - Allows you to specify a folder, a service, or an app to save the screenshot in. The selections are the Desktop, Documents folder, Clipboard, Mail, Messages, Preview, and Other Locations. The selection you make is used for all subsequent screenshots and screen recordings. Timer - Screenshots are usually taken right away. By using the timer, you can set a delay of 5 seconds or 10 seconds. You can use the delay to allow you to capture certain events such as opening a menu and selecting an item. Show Floating Thumbnail - When selected a thumbnail of the screenshot you just captured will be displayed for a few seconds, allowing you to see if you captured an event correctly. Remember Last Selection - Allows the screenshot toolbar to open with the same capture modes preselected. Show Mouse Pointer - Allows the mouse pointer to be included in a screen capture. Selecting the Record Entire Screen will cause the cursor to change to a camera. Clicking the mouse or tapping the trackpad will start the recording. You can also start by clicking or tapping the Record button in the screenshot toolbar. To end a recording session click or tap the stop button located in the Mac's menu bar. This option allows you to predefine an area on the screen that will be recorded. Click or tap the Record Selected Portion button. Use the instructions above for Capture Selected Portion to position the crop outline. When your ready click the Record button in the screenshot toolbar. To end the recording click or tap the stop button that appears in the menu bar. You can use the Markup function that is included with macOS Mojave and later to perform basic editing such as setting the start and stop points of the recording. Access the Markup function by right-clicking the recording thumbnail image that appears for a few moments after you stop a recording. Selected Markup from the popup menu. Click the Trim button in the Markup window that opens. Use the Start and Endpoint sliders in the timeline to set the beginning point and end point of the recording. You can also access the Markup function from the Finder by opening a Finder window and navigating to the folder where the recording was saved. Select the recording, then click the Trim button in the metadata panel. The markup window will open with the recording already in the trim mode for you to set the start and stop points.